After a full month of using the Spornia Pop-Up Automatic Ball Return Golf Practice Net, we believe it’s durability and purpose, suits the needs of a wide range of golfing expertise and prestige. Our students and coaches cannot get enough of the simplicity of this valuable golf net and we have had great feedback. Some reviews would bore you with the mechanics, but in the following analysis, there will be tips and drills to be able to utilize your time and enjoyment with the Spornia Automatic Ball Return System; as well as, some fancy words that will make you drool when you think about golfing practice. UPDATE 11/1/2017 – So it’s been well over 6 months since we began using the Spornia Golf Practice Net with our students, and it has drastically helped us increase the number of students we can coach because we are not restricted by the location of the closest driving range, plus weather is not even a factor. Moreover, all of our students who decided to take the bullet and shell out the $200 for the Spornia Golf Net has been raving about it and could not be happier with their purchase. Not only are their swings more consistent, but they also have improved their scores by an average of 4 to 5 strokes. 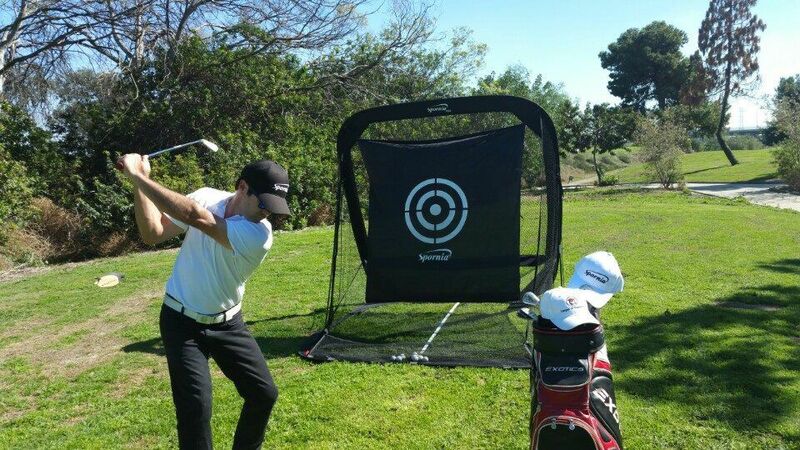 The Spornia Pop-Up Automatic Ball Return Golf Practice Net is the best substitute for the actual driving range. 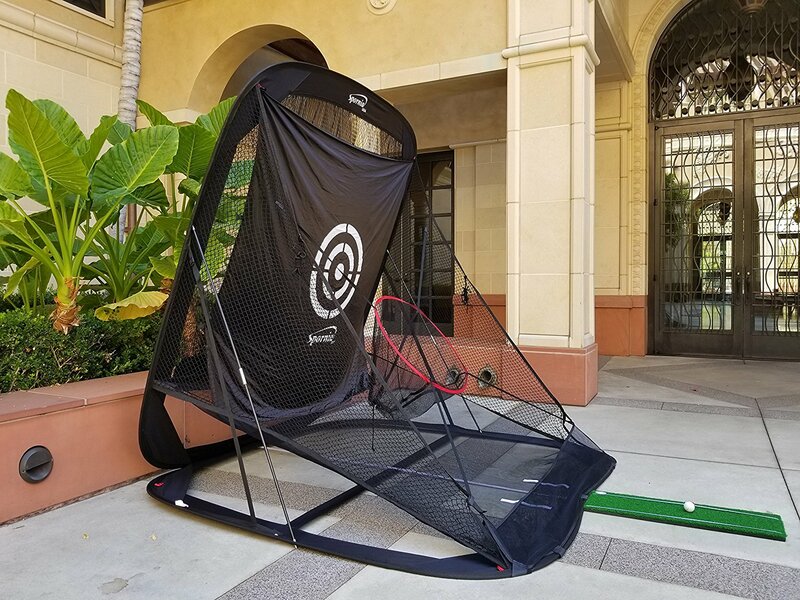 The intuitive design of this practice net allows you to practice your drills and techniques in the comfort of your own home, office, or garage and use every club in the bag. The Spornia Net was a valuable golf equipment for our coaches, especially because of the recent storms we’ve been getting out here in Los Angeles, California (Feb. 2017). Our coaches were able to visit their students’ homes and coach them just as they would at a driving range. And with the clever patented target and lining in the center of the net, the ball automatically returns to you saving you the trouble and time chasing the ball. The net also saves you an extra $10 to $15 for a bucket; all you need is the Spornia Golf Net and a single golf ball to practice whenever and where ever you please. Whether our coaches were working on putting, chipping, sharpening the irons, or optimizing the driver, the Spornia’s automatic ball return system made each uninterrupted golf session possible inside the house or in a garage. The Spornia net also comes with two protective side mesh panels to save you from a stray ball ricocheting off the wall and into the TV or a window. In addition, we also noticed the clever engineering of the raised net so the ball never touches the floor as it returns back to you. This is important because you never have to worry about the ball damaging the floor. Moreover, unlike other products in the marketplace, the Spornia practice net provides double protection after you hit the ball; there is a reinforced padding behind the initial protective net which provides visual reassurance that the wayward shots will not find the television, the priced vase, or damaging your walls behind the net. The patented technology in the padding of the target also diminishes the sound of the corresponding impact. Every aspect of the Spornia Net is made to bring the driving range into the comfort of the home allowing golfers to practice and warm-up day-in-day-out. Without fail, once you step up onto the first tee, you won’t have to worry about your feet, shoulders nor hips. It’ll just be instinctive, just like the tour professionals. Although the price tag hovers right below the $200 mark, this golf net tends to be one of the most long-lasting net that money can buy, and with a one year warranty on the frames, the manufacturer guarantees it’s quality. UPDATE 11/1/2017 – Added option to the Spornia Practice Net is the chipping basket. The position of the chipping basket is adjustable so you can practice your accuracy and strength for each chip shot. There isn’t much holding back the supremacy of the Spornia practice net. 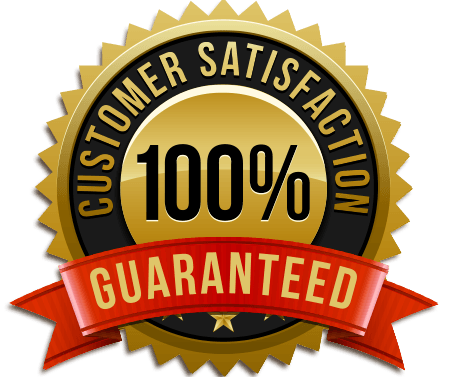 But if we inspect the nitty-gritty of the product; there are two hindrances you will want to know before indulging your money into this golfing gadget. As much as you can feel you’re practicing at an actual range, the scale and size of the Spornia net are relatively small compared to other competitors on the market, especially to the Net Return Pro. Although the reduced height encourages for use in the home, we recommend staying away from practicing the high wedge shots; the width could also be an issue for beginners practicing chip shots further away from the net. I would recommend that a few driving range sessions are in order before getting your teeth into using the Spornia Net. Furthermore, like many other golf nets, the Spornia net requires an additional hitting mat. Something to ponder over, as additional resources are needed to use the net itself. UPDATE 11/1/2017 – The new Spornia Golf Nets are equipped with another patented design that allows users to change the angle of the net. This has been a game changer when it comes to using your wedges because the additional angles help with catching shots with a greater loft. Just remember, when you are using your wedges make sure your are not swinging from a distance; move your hitting mat right up to the base of the net. Why Spornia Pop-Up Practice Net is better than the Net Return Pro? First and foremost, the price. The Spornia net is a crumb of the price; for $199 on washmyballs.com, the Spornia net beats the Net Return Pro in all categories. Starting at $595 (The Net Return Pro Series Golf Net), it seems rather pricey for a device that has limited capabilities for use inside the home. It’s size and girth of the Net Return Pro doesn’t tend to ease of use as well as portability. In addition, the setting up of the Net Return Pro takes much longer and is a more permanent setup compared to the Spornia Net. The Spornia net, tends to be smaller, but this means its versatility multiplies in value. You can set up the Spornia Practice Net in under a minute; even better, you can also fold up the net in about 40 seconds! Also, with the Spornia Practice Net weighing in less than 20lbs, you can carry it around with ease. Since it does need a hitting mat, we recommend the Emerald Par Golf Mat on Amazon, or if you want the top of the line hitting mat you can go for the FORB Driving Range Mat. The target on the Spornia Practice Net is also a great way to practice your accuracy which the Net Return Pro lacks. And, with a little practice, you can determine if you are hitting a straight shot, slice or a hook by the way the ball returns to you. The Net Return Pro doesn’t have any way of telling you how well you hit the ball. Overall, a sound product with great productivity possibilities. The Spornia Automatic Ball Return Golf Practice Net has patented technology which has boosted its ranking and rating from many reviewers due to its quality and innovation. A net, having patented technology rather than just a net to catch the ball is clearly a game-changer; especially in regards to indoor golf, where sound and noise complaints are among some of the important issues for golfers who want to keep an amicable home environment. The Spornia practice net is a premium product with a mediocre price bracket. I don’t believe that the Spornia product is too cheap to deter the high-class individuals, neither too expensive so not to break the bank accounts of addicted golfing gurus. The practice net brings hours and years of fun where the same money will only get you, on average 50 buckets of balls, not including gasoline to get to and from your chosen establishment. They say it’s a case of apples and oranges, well, if you ask me; the Pop-Up Practice Net is a no brainer, good value that you’ll never regret purchasing.